Posted on January 14, 2019 by Smorgasbord - Variety is the Spice of Life. Welcome to the first Cafe and Bookstore Update for the week. The first author with a recent review for the prequel to her successful Howarth Family Trilogy A Hundred Tiny Threads is Judith Barrow. I expected this novel to be a typical historical romance but it was much more than that. It was gritty, it pulled no punches and this made the characterisation and events more real. The author enables you to connect with the story through knowledge of historical events and just the way life was…and still is in many ways. I also found it educational as it broadened my understanding of the suffragette movement and also the troubles in Ireland and the black and tans. Her description of place enables the reader to visualise the settings easily and the relationships between her characters are believable…no typical happy ending which I liked. Fall in love this holiday season! A grieving man finds the greatest gift is love in this heartwarming holiday romance. Molly McCarty is in need of a new beginning after a disastrous divorce. When the opportunity to invest in a bed and breakfast appears online in Christmas, Michigan she’s intrigued. A snow storm derails her travels and leaves her at the mercy of a grim stranger- who turns out to be her new partner! Noah Kincaid loses his parents in a tragic fire that leaves him scarred inside and out. He’s raised by a great-aunt and is devastated when cancer takes her life. But vowing never to care about anyone again is hampered by his troublesome new partner and her son. Will a Christmas miracle bring three lonely hearts the gift of love? Heartwarming love story! 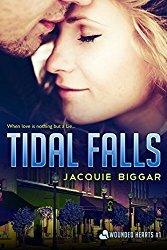 This the first time that I read a novella written by this new author Jacquie Biggar. She didn’t disappoint me with this short love story ‘Mistletoe Inn’. What a sweet story! It tells the sweet and romantic story of Molly, who needs a fresh new start after an awful divorce and Noah, a bruised man suffering of PTSD. During a snow storm, both their worlds collide with force and a build new friendship. Along with her son Leo, all three will embark on a Journey of hope, trust and romance. And finally a recent review for Daniel Kemp and his thriller,The Widow’s Son released just before Christmas. I’ve always enjoyed a good spy thriller and over the years have enjoyed reading John le Carré, Len Deighton and Graham Greene. Most spy thrillers focus on the work done by the agent in the field and few are centred around those who supervise and direct those agents. Daniel Kemp’s protagonist, however, is the new chairman of the British Joint Intelligence Committee responsible for directing intelligence operations, which made for a fascinating read. Given a seeming impossible task and not knowing who he can trust, time is running out for the action is set in 2002 not long before the Second Gulf War. I won’t spoil the plot for readers, but I was engrossed by the story and really enjoyed it. Thank you for dropping in and I hope you have found a book or two to add to your TBRs… thanks Sally. This entry was posted in Book Promotion, Sally's Cafe and Bookstore Update and tagged Daniel Kemp, Jacquie Biggar, Judith Barrow by Smorgasbord - Variety is the Spice of Life.. Bookmark the permalink. Daniel Kemp’s is relatively new to me, Sally. I like the sound of his book. I need to read this book by Judith too. I wish I had more hours in a day. Thank you, Sally, and thank you, Roberta, for the interest. Great authors and great reviews. Thanks for sharing, Sally and good luck all! Congrats to Daniel and Judith! Thank you for this lovely morning surprise, Sally! Excellent choices, Sally. Super authors and reviews. Congrats to the authors on such great reviews. Jacquie’s book is on my TBR. The others sound excellent as well! Thanks for these reviews, Sally – some more interesting titles to add to the list. Fantastic reviews! I was not familiar with Daniel Kemp, so thanks for the introduction, Sally! I have Judith’s book on my TBR pile. I can’t seem to make a dent. This year I plan to read more!! Thank you, Darlene – we should vote for more hours in the day – but then we’d only find more books to read, wouldn’t we?! Haha! Exactly!! If only I didn’t need to sleep.